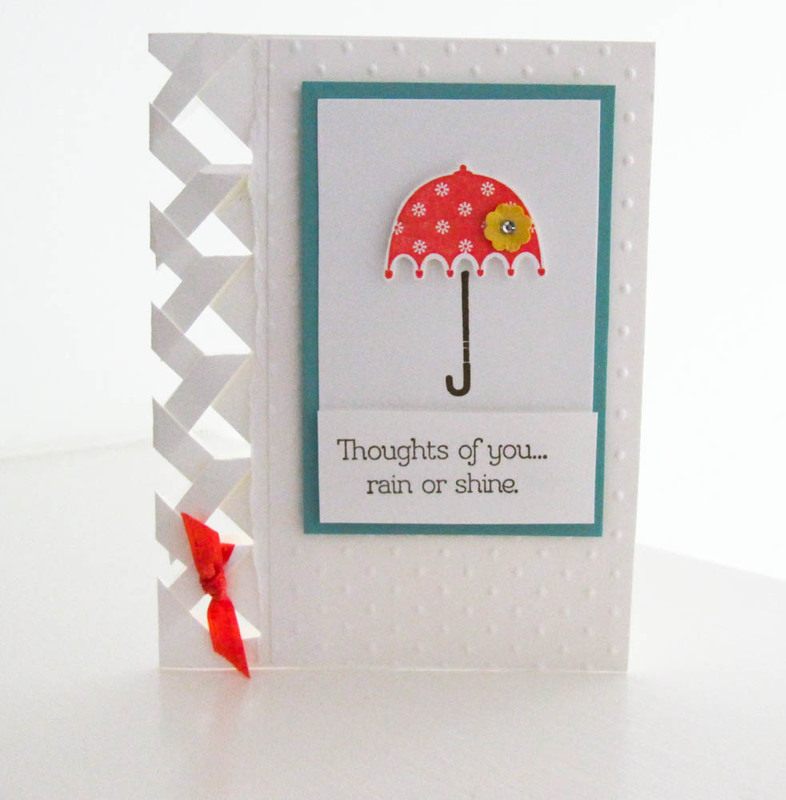 Today’s card is a braided card designed using the Stampin’ Up! Rain or Shine stamp set along with a braided card template to create this beautiful, intricate braid. ive been trying the braidedd card tachnique . could you specifify how long the cut marks should be and how far apart . thanks love the card and want to make some . I’m sorry for the problems you are having I have put the link with the video and template below. Once you get to BrandysCards.com at the rain or shine page just scroll down below the video and you will see the link for the pdf of the template. I hope this helps and please let me know if I can assist you further. I was impressed with your braided card. What a great idea. Appreciate getting the template to make a card. Is the stamp set still available? Today, February 11, 2014, I am featuring your braided card which I absolutely love love love along with one of Create With TLC’s newest images and sentiments – purrfect combination!!! Hope you have a chance to stop by. Thank you for your inspiration! I love this card and technique. Thank you for sharing the video tutorial and template. Can’t wait to get started. You are very inspiring! Have a great day! I love this technique. I made 2 cards already. They are on my blog, if you would like to check it out. This card is gorgeous. Thanks so much for the template. Can’t wait to try it. I love the braided card technique. 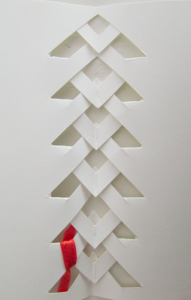 I am going to try it today for a Christmas card. also I liked the 20 cards assembly line idea. I am also going to try the doily card (medallion card). your cards are all so pretty and looks pretty easy. thanks for sharing. Trudy. I love, love, love this braided card technique. I can’t wait to make this card. Just loved your braided card. Thank you so much for sharing it with us and also for the template. I saw a card using this technique on a group that focuses on Stampin’ Up products and being a new demonstrator and also being new to card making I look for anything that will add a “Ta Da” to my cards….I thought when I first saw this I would not be able to do it…..however I printed your template and followed along on your video and I did it!! 🙂 So easy…thanks so very much! Hi! I love your card and think it’s great. I wanted to give it a try but was unable to download it. The link just took me to a page with a bunch of tiny lines and it wasn’t the right lines. I LOVE this technique and I loved your video. Thanks so much for adding the bloopers at the end. It cracked me up! PS. I had no trouble with the download. This is a really neat technique. I can’t wait to try it myself. Thanks for including the template. Thank you kindly for stopping by BrandysCards. I appreciate your feedback and support. Thank you! I apologize for the trouble finding the template. I just sent you an email. I love your card and thanks for including the template! Loved the braided card, thank you so much for sharing the template! This was a great idea! I have thought of tons of uses for this technique…and i only learned it yesterday! Thank you for the inspiration! 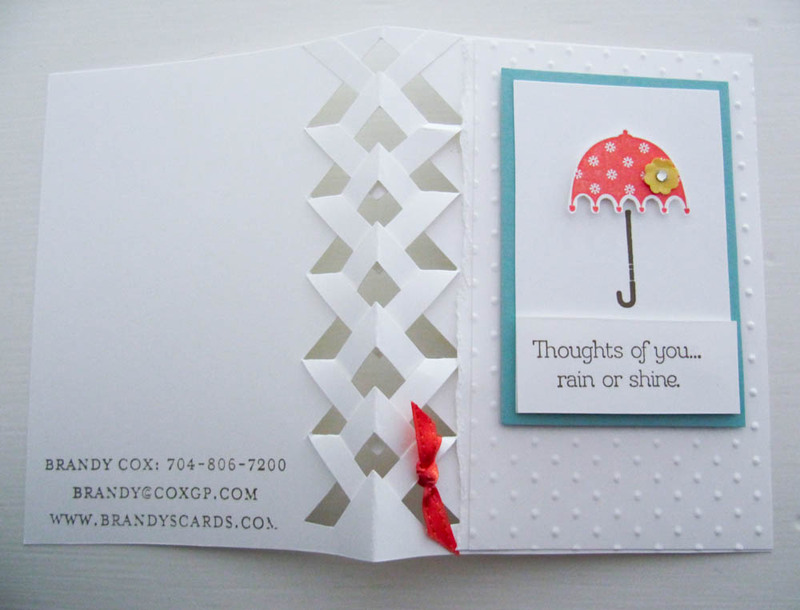 Brandy….WHAT an AWESOME CARD…..it’s so easy, and different ! I am going to CASE this card to send to a friend’s mom who is critically in the hospital ! Thanks so much for showing this wonderful technique! Thank you kindly Carol!!!! Happy Stampin’! Just love this card! I have seen this technique before, but never had the template. I have downloaded the template and can’t wait to try it out! Love everything you do! Hello, thanks for your details to make this Card. Your Card is sweet. Pingback: Michaela, danke für die Inspiration! Brandy – I love this card! I really like your video setup – your sound is clear, the light is good and I appreciate the way you film you with the project details and then flip to the overhead camera for demonstration – nicely done!! Thank you Brandy for your amazing videos I love them.! when I downloaded and printed the template for the braiding it came out too small, only 2 3/4″ long Any suggestions for me? Christi, mine was also too short but realized that my computer/printer was doing a “shrink to fit” so have just now printed full size. I’m hoping that will help though haven’t tried it yet. Hi Brandy! Love this technique!!! It looks like the picture shows an extra torn layer in between the braided section and the embossed layer. Is that right? I didn’t hear you mention it in the video unless I missed it. Brandy, you are adorable. Loved the braided card. Thank you for posting. Love the card and yes I did try it. It was so easy. You make doing cards so simple. beautiful and fun. Brandy, I love your braided card. 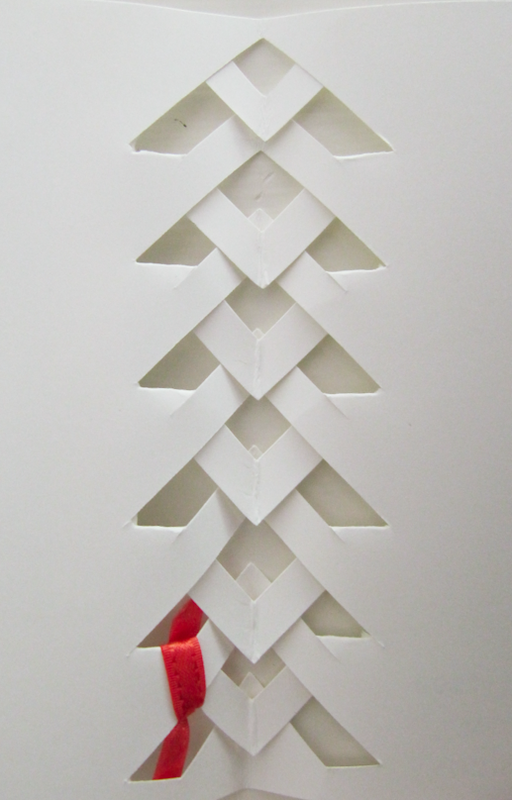 I also tried to put the braid on the front of the card. It is so cute .Thanks for all your wonderful videos…. Love this card and technique! Thanks for sharing it with us on this great video. Thank you so much for the template. I’ve forgotten twice when I was there to get a copy. You’re a mind reader and a God Send. See you Monday. I’m the “Hostess” this time, and I’m so excited! I just loved this card concept. Thank you so much for sharing. I printed out our template to share with my card club gals next month. They will love it! Thanks again. Thank you soooo much for the template for this card! I don’t have the diagonal plate for the scoring board and that was the only way I’ve seen this card made. I loved the bloopers – you probably would have had fewer if the “male” behind the camera hadn’t been laughing at you, LOL. I enjoy your videos and thank you for sharing! I look forward to more videos. I love watching your videos!! Thank you Karen! I appreciate your friendship and support. Have a crafty weekend! Here it is… I forgot to add it in the post after it uploaded. Oops!!! Sorry friend. Hope you give it a try. Super fun! Maybe it’s too early in the morning for me, but I don’t see a video tutorial for how to make this very interesting card. Would you guide me to the tutorial? Thanks! It seems that the link to download the template is not working. Could you please send it to me? Love this card! The braid is so different and adds so much to the card; however, I am unable to download the template for the braid. There is no link! I will come back again to hopefully download it another time. Thank you so much!